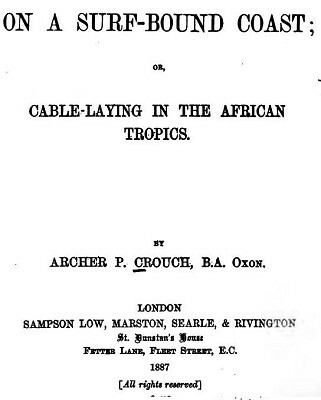 archer crouch : body surfing, west africa, 1887.
or, Cable-laying in the African tropics. S. Low, Marston, Searle & Rivington, London, 1887. Crouch has many experiences in surf-boats on the coast of West Africa (not reproduced here), however it is his rare account of swimming in considerable surf and observing and taking instruction in the art of body sirfing from his native assistant, Su, that is unusual. The native fishing canoes here are very neatly shaped, far superior to any we have seen down the coast as yet. They all seem about the same size - fifteen to twenty feet long, with good breadth of beam. Light thwarts made of strong osier twigs run across the canoe at each end, and in the middle. There are generally four men in each canoe, and early every day they can be seen taking advantage of the land breeze, which blows in the morning, to rig up their small white sail, and travel far out to sea, returning in the afternoon with the sea breeze which springs up about four o'clock. This afternoon I see a whole fleet of them racing home, and count as many as thirty-five. Our chief steward hails the men in one of them as they pass close astern of lis, and beckons them to the gangway, where he inspects their fish. They have a couple of large fish and a number of small ones about the size of mackerel. He takes a big one and several of the smaller ones, but when we try them at dinner they are not a success, the big one being very coarse, and the others being chiefly noticeable for an absence of flavour altogether. At eight o'clock, at the conclusion of my watch, I feel very much tempted to have a dip in the sea ; but hesitate for two reasons. one as soon as he puts his foot in the water ; and secondly, because the breakers are roaring away louder than ever only a short distance from the beach, and look rather alarming, if one is not accustomed to encountering them. In my difficulty I call to our servant Sua, who is preparing a morning cup of cocoa on the paraffin stove outside the hut. This morning he is dressed in his best clothes, consisting of a jersey, and blue serge coat and knickerbockers ; but when he is cleaning out the hut, or doing work which he thinks may injure such fine apparel, he lays them aside, and appears in nothing but the scanty waistcloth. He answers, " Yes, sar," in response to my call, and comes to the hut door. "Are there any sharks about in the water here, Sua ? " A puzzled expression gathers on his face, and he scratches his short wool pensively with his left hand. "Sarks, sar ? No sabby sarks, sar," shaking his head and regarding me with a troubled look. "Big fish," I say, descending to pigeon English to make myself understood. "Big fish, bite man, no live here ? "A smile of intelligence passes over his features. "No, sar, no big fish live here. Big fish far out there, not here." "I think I will bathe, then ;" and I begin making preparations. When he sees my intention, he says, " Massa go washy ? " and immediately proceeds to divest himself of his clothing and, running down the beach, dashes into the surf as I follow him at a short distance. He swims through the foaming water of a spent breaker, and as another comes rolling up and curling high above him, he dives beneath it, the column descending with a loud roar behind him. There is a few seconds' interval, and then his black head appears bobbing up and down in the white fringe of foam beyond. I don't quite like the look of it, but as he has given me a lead I cannot draw back now. opportunity, I dive into the curling bank of water and then I hear a dull rushing noise around me, and at length emerge securely in the seething foam beyond. Sua is here in his element, dancing up and down and doing fancy performances with the rollers, as if he had lived since infancy as much in the water as on dry land. "See, massa," he cries, as a big roller comes towering along ; "see me go." Watching it carefully till it is just upon him, he turns his face to the shore and rising on to the top of it he strikes out vigorously with it towards land, and is carried dashing in at a tremendous speed after the same manner as the surf-boats beach themselves. I try to imitate his example, but not with such success, in my haste and inexperience getting too much in advance, and being rolled up with the breaker instead of riding on its crest. However, I come out of it all right after a little tumbling about, and scramble out to find Sua on the beach highly amused by my performance, grinning from ear to ear and saying, "Var good, massa ; var good." Geoff Cater (2013) : Archer Crouch : Body Surfing, West Africa, 1887.